Sailing courses - Cap-sailing : le plaisir d'être sur l'eau ! The little Optimist is the perfect boat for the first sailing experience ! Sorry, our platform is still in french ...! Camarans offer to our teenagers fast exciting sailing experience ! Dinghy solo : Open Bic. The perfect step between Optimist and Laser. For those who want to improve sailing skill. A good level in Optimist is recommanded. Catamarans offer fast exciting sailing experience ! Our boards are large and steady. 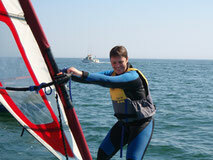 Our sailing courses are adapted for beginners or almost or for people with and avarage level. Booking online is not available for windsurfing courses. Please give a call or come and see us on the beach for enquiries.